Partha Sarathi Ghosh, 43, head, financial and planning systems for Aviva Life Insurance, travelled to Turkey in August with his wife Indrakshi and daughter Sucharita. Despite a packed itinerary, there was still time to chill. Istanbul, Cappadocia, Oludeniz, Ephesus and Bozcaada—how did you zero in on these Turkish destinations? I also wanted to keep my 10-year-old daughter engaged through the trip. So, variety was necessary. As with most of Turkey, there’s so much to see in Istanbul. We spent four days there, and they weren’t enough to fully enjoy the city: After all, Istanbul was a world capital for 2,000 years, there’s so much diversity in culture and history. Sultanahmet, the historical Constantinople, is where the Blue Mosque, Aya Sophia and Topkapi Palace are located. While the mosque and the church are justly famous, it was the Topkapi Palace that was the most impressive. We especially liked the harem, with its exquisite inlays, gold-plated carvings and beautiful tiles. In the treasury, we saw a Mughal throne looted from Delhi. Our guide told us that the Ottomans raided Persia after Nadir Shah’s death and brought the throne to Istanbul. You also went to see a Sufi ceremony at a dervish monastery. That’s right. There’s a monastery near Galata Tower in Istanbul called Galata Mevlevihanesi, after the Mevlana sect founded by Jalaluddin Rumi. 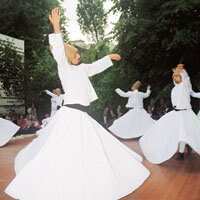 Sema is a form of worship in Sufism which centres around revolving. The Semazens, the ones who whirl, participate consciously in the shared revolution of all existence. On a Sunday, we saw a group of musicians play Sufi music while the designated leader and his followers performed a ritual and slowly started to revolve. Though Westerners like to focus on the whirling dervishes, it was the familiar philosophy of tolerance and brotherhood that impressed us most. Even my daughter was engrossed in the proceedings. Cappadocia must have been a similarly interesting experience. In quite a different way. It’s a Unesco World Heritage Site. Some 60 million years ago, two volcanic eruptions created a surreal landscape here, with “fairy chimneys" and caves. In fact, we stayed in a cave hotel in a small place called Göreme. Because of its location, Cappadocia was invaded repeatedly through history. To escape invaders, the locals built these amazing underground cities.I think some 36 of them have been discovered till date. We visited the largest, Derinkuyu, which could shelter 20,000 people. It goes down 18 storeys into the Anatolian Plateau, and has separate living areas, common areas, churches, kitchens, animal pens and 1,500 ventilation ducts. We are not claustrophobic, but the narrow tunnels—so narrow that you have to walk in single file—can definitely make one uncomfortable. After that, Oludeniz and Bozcaada must have been quite refreshing. Yes, they were. Oludeniz is a resort town on the Mediterranean. We went for a day-long cruise on the Mediterranean and packed in a day trip to Dalyan as well. But Bozcaada was something else—it’s a tiny island in the Aegean, 6km in length and 5km wide, with Greek-style houses, vineyards and pine trees, located almost diametrically opposite Troy on the mainland. We stayed in an old wooden Greek house, with high ceilings and French windows. The landlady lived on the ground floor and invited the whole neighbourhood to come and see us when she heard we were from India—they had never seen Indians before. Narrow roads, lovely beaches, excellent seafood, good local wines from Talay and Corvus wineries—we felt we had earned this. So, was that the high point of the holiday for you? No, Ephesus, our penultimate stop before catching our flight back from Istanbul, was just amazing. Alexander the Great came here, as did St Paul to preach Christianity and St John to write the gospel; Virgin Mary is supposed to have spent her last days here. Though abandoned in the fifth century, the Greek and Roman ruins are extremely well preserved and very tourist-friendly. I think we did a very sensible thing by arming ourselves with a guidebook while exploring the ruins—that way, we could take our own time. It was awe-inspiring to think we were walking down the same road that Alexander had once walked on.